If you're talking about P-54's versus the P-70's, there was a world of difference. P-54's had toilets that emptied directly onto the tracks ("Passenger will refrain from flushing toilets in the station"). The floors were black and gay checked pattern tiles. For a long time, the windows still could be opened - if you could get the catch to push downward. They had a smell all their own, and yes, you could flop the seats over. They were green vinyl. You could stand on the rear platform, separated from your certain fate by a few chains. At one time, you could ride while standing in a combine end, along with your string of flounders from Oyster Bay. The FM C-liners didn't rev, they growled as they wound up. The ALCO C420 didn't sound half as menacing, but boy, did they leave a stain in the sky! Sometimes they shot flames from the stack. The MP70's and MP-72 conversions were mostly the same, only much more modern and longer, sleeker. When they started to paint them in "platinum mist" and blue stripes, it was like painting an old banged up gray car into an old banged up silver car. It was supposed to be modernized, but I doubt it fooled anyone. Another thing was reuphostered seating from the old green to something of a color circus. TO this day, I see photos and wonder what it was supposed to fix. The FA power cars were different and something new. I know of only one or two trains buckling due to the locomotives pushing on the rear of a string of cars. I have often thought there would be a great deal of stress on the cars sandwiched between a power car and the locomotive. The original color scheme was actually quite pretty, but Lord, the ALCO 244 PM's were filthy, and the power cars got covered in soot so quickly, they were almost a disgrace to look at when standing still. You could tell new arrivals not by number, but by how filthy they were. I don't think LIRR ever washed the FA's, except possibly after some heavy repairs! Still, I'd take the platinum units over the God-awful blue mess they were repainted. I wonder if the 244's were repurposed after removal, sold as spares, or simply cut up? When the ALCO's were retired, the RS 1's, RS 2's, and RS 3's had probably run out their service years. Funny how the RR would scrap so many locomotives that were still in serviceable condition. The original C420's still had years of service left in them, and same for the second batch. It's ironic the second batch went to Naporano in operating condition and died without turning anymore miles. The original 22 locomotives continued for years, and a few are still serviceable today, or waiting to be rebuilt for operation - and it's 2019! Locomotives and coaches made a real train, a real train riding experience, with turntables or wyes at the end of the line. The DM's and DE's are probably the economically correct thing to do. I've never ridden on nor do I wish to. I have read they're awful locomotives and the cars behind them are no bargain either. With their initiation and so many "improvements" from which it's difficult to undo, I doubt we'll ever see real trains hauled by real locomotives, with real coaches again. "The Great People Poop Wreck"
Some know Brooklyn as the home of Fort Hamilton, the place they took their draft physicals and were ushered into the armed forces. Some know Brooklyn as the final bastion of steam switcher service into the 1960's. It is memorialized as home of the Brooklyn Dodgers and Ebbets Field. It is the home of a recognizable accent, and the eastern side of New York's most memorable and historic bridge. For my father, it was none of these. For Dad, it was the location of the biggest railroading nightmare he faced in his 45 years of service to the Long Island Rail Road. The nightmare was called "Bay Ridge Yard". Bay Ridge faces the southern side of New York Harbor, edging the Atlantic Ocean. The Long Island owns the track, and until the 1950's, Pennsylvania Railroad B3 electric boxcabs sorted freight cars under catenary wire, and loading them onto car floats, to be shoved across to New Jersey and sent on to the rest of America. With the end of Pennsy dominance, Long Island's fleet of electric locomotives was culled, and yard switching was handed over to Baldwin Diesels. The wires still stood but the source of freight became the New Haven Railroad. Trains were lugged down over the Hell Gate bridge, most often behind the blocky, ex-Virginian, EF-4 electrics. These heavy locomotives often caused rails to roll or crack. If that wasn't enough, the local youth vandalism was vicious. Sometimes it was switch locks broken, turn-outs being thrown, and cars on the ground. Sometimes it was kids climbing onto the slowly passing freights, reaching up to grab the wires, and the results catastrophic. Bay Ridge wasn't a fun place to grow up, live, or work. As the population of Brooklyn grew, the City of New York had to face facts regarding living conditions. Urban renewal meant replacing tenements and management of waste water, which is a nice way of saying, "What do you do with sewerage once you flush." It couldn't be dumped in New York Harbor any longer. Once it had been the practice that when one flushed the toilet, and the waste disappeared, it simply was passed on waves, through a number of subterranean brick and concrete tubes, and dumped, "sploosh", into New York Harbor. With a rising population and the growth of urban properties, this approach was no longer feasible. In fact, New York Harbor had become a dead zone. Where sturgeon historically migrated up the Hudson River, was now occupied only by heartier species of soft shell clams and Horseshoe crabs, feeding on whatever settled into the muck and, in legend, the occasional mortified gangster. Then there was the fact that along the southern shore of Long Island and the Coney Island beaches, evidence of human inhabitation was washing ashore. The response was built just on the southern side of the Bay Ridge Yard. In the 1950, Owls Head Waste Water Treatment plant was constructed. The sewerage plant was a series of huge tanks, with twelve inch thick walls, built of concrete, reinforced with steel grids. The contractor had built similar tanks in California, and they continued to function without problems. This composition was stronger than concrete alone, stronger than steel alone. A modernized sewerage system pumped the human effluent into the ten immense tanks where it was screened, settled, digested by bacteria, made less toxic, and eventually separated into liquid that was acceptable for release into the ocean directed current, and solids that could be used to fertilize parks and to cover landfills of incinerator ash and refuse picked up off the streets. On the railroad side, next door in Bay Ridge Yard, tugboats ferried in empty car floats and left with barges loaded with scores of freight cars. The only connection to the Owls Head Waste Water Plant was the ominous odor of bacterially generated gases carried in the cooling sea breezes as land temperatures rose during the day. The familiar "rotten egg" odor was largely composed of hydrogen sulfide gas, which might have been a possible clue that water absorbed by the concrete walls contained sulfides, and sulfides were coming in contact with the steel wire in the pre-stressed concrete. It hadn't been a source of concern in over 2,500 other tanks built in this manner, so it didn't raise concern or suspicion at the time. And rust never sleeps. On a night in April, 1961, it became a major source of concern, if you were a brakeman assembling a train, or a conductor working in a New Haven caboose, or an engine crew suffering through that awful odor that seemed to be stronger than ever experienced before. In the early morning hours, over the thrumming of Diesel engines, a grinding, groaning, cracking, sound emanated from one of the filled-to-the-brim tanks of raw household sewerage. What followed more or less defies human imagination. A deluge in excess of 2,000,000 gallons, of human effluent, comprised of everything that passes down a kitchen sink, the "S" tube of a toilet, a bath, or shower exploded outward. Green "combers", with surfing "bergs" of fractured rubble, overwhelmed the railroad yard. The concrete bowl of the tank scattered itself over the tracks. A steel New Haven caboose simply bowled over, as did loaded refrigerator and hopper cars. The yard was a mire of ...of... yuch! What did not settle into pools between the tracks, simply rushed to the car floats where it remained dripping at daylight. My father, along with other officials of the track department, got the call in the middle of the night. For whatever reason, he thought to carry along his Argus C3, and what you see in these pictures is, to the best of my knowledge, the only pictorial record of what became known as "The Great People Poop Wreck". In the twenty-first century, one can only imagine O.S.H.A. handling this with personnel in Haz-Mat suits and self contained breathing apparatus. In 1961, specialized gear called for gum rubber shoe covers for executives, while the work crews wore the usual steel toed boots. No doubt a great deal of laundry was done each night until the scene was cleared of wreckage and the tracks restored. During clean-up, the remaining treatment tanks were drained to half-depth. The un-ending accumulation of waste water was managed by pumping it onto barges and towing it ten miles out to sea, where once again, out of sight meant out of mind. Ocean currents then reinvested the material back on the coastal shoreline. Whether it was a build-up of waste generated gases, a poor quality of concrete, or rusting through of the wire mesh inside the walls, would be argued out in court well into the summer of 1962. The tanks were eventually drained and plated with steel. The effect on the rail yard was considerably different. Retired railroaders reported that once the concrete debris was gone, the waters evaporated, and things set to right, a garden blossomed in the yard; vegetables! The plants thrived. It was not unusual to find red tomatoes, firm zucchinis, and other vegetables growing in amongst the ties. Whether they were harvested or not, I am unable to say, but obviously, more than a tree grew in Brooklyn. Today's Owls Head facility, is sandwiched between the edge of the Belt Parkway, and the retired railroad facility. In 2012, it still elicited odor complaints from neighbors, but has been rebuilt and is an active part of lessening pollution and raising water quality in the Hudson River and off-shore. Merged into the Penn Central and its successor Conrail, the New Haven Railroad no longer exists. Freight is shipped over tracks of the former New York Central, without touching Brooklyn. At Bay Ridge Yard, the catenary wire has been sold as scrap. The car floats and tugs are a memory. The remaining track is used as a storage facility. Occasionally a Long Island MTA switcher wanders into the yard to pick up or drop off a random car. The railroad was a job to my father, and not much more than that. It assured him that his wife and kids would have food, a comfortable home, and a decent standard of living. The job squeezed every drop of live out of the man from the time he entrained each morning, to the moment we picked him up at 5:17pm, each night, at the far end of the Syosset platform. On the other hand, I loved the railroad. I loved the stories, I loved the locomotives, I loved pretending to be an engineer, using cardboard boxes as a child, and graduating from Lionels to H-O gauge, as I grew up. When he brought home a copy of “Steel Rails to the Sunrise”, I feasted on tons of information both from history and stuff he knew, but never talked about. He never talked about the infamous trio of wrecks in 1950. He saw too much at Rockville Center, and got it worse at Richmond Hill. We lost a neighbor at the former, a young woman who was decapitated in her seat while trusting the carrier to bring her home. Then there was the poor guy squashed against the windows of the coach at Richmond Hill, gruesomely depicted in the Newsday extra. Even twenty years later, he repressed so much of those events that he only grudgingly gave up short recollections. Of course derailments and wrecks were a major part of the job. It was rare that I could accompany him, but the rare occasions occurred. My earliest recollection of “being on the job” was when I was about age seven. A monster Fairbanks-Morse C-Liner kept picking the switch at Ronkonkoma. No matter how many times they tried to pass over the point, the center axle kept dropping. I was actually allowed to walk around while the big locomotive traveled four feet in both directions until the snapped switch point was found and the orders had been given to rebuild the switch. The massive F-M’s were famous for that little trick. I still have the broken switch point in a box, packed away with other boyhood trivia. On another occasion, the whole family went out in our 1954 Chevrolet to Riverhead, the exact crossing where the RMLI is located today, to see where a Borden’s Dairy milk truck had gotten clobbered by an RS3 and train at speed. When we arrived, the fire department had a sheet over the crushed cab of the truck, and broken milk cartons covered the ground. Clearly, this is not what the old man had envisioned as a family trip. My mother took my sister for a walk, but I slipped away and wandered down the tracks, only to stumble on part of the deceased truck driver! The locomotive and empty train was backed into the station with what I suspect was negligible damage. The passengers had been bused to Greenport. As a souvenir, I picked up the milk truck’s window sign that read “No Riders”, and brought it into Second Grade show and tell the next week. The broken glass haunted me, and eventually, it got disposed of. Dad hated the snow. I can’t remember how many Christmas and post-Christmas storms he worked 72 hours straight, with little or no sleep, either in Jamaica or in Hicksville. Some trackmen wouldn’t pick up the phone when they were needed, others were true “railroad men” who like my father, came out and slugged away in the cold, thawing switches, digging out drainage conduits, and doing what needed to be done. Until the seventeenth year of his retirement, when he succumbed to lung cancer, he still hated snow, although in the end, he rode his own Kubota tractor to clear his one driveway, and there was some satisfaction in that. If there was a Hell on the Long Island Rail Road in the 1960’s, that Hell was Bay Ridge. The track was shared with the New Haven Railroad, and their heavy E-33 electric locomotives constantly crushed the Long Island tracks. Rails spilt, rolled, spread; everything trackage can do. The local Brooklyn kids had no compunction about throwing switches and watching a locomotive and train of loaded freight cars spill onto the ground. Frequently, they got caught on the tracks as locomotives rolled up from behind and ran them down. Dad always went out on these calls. I did go down with him to see a freight train that had tossed, and sat on a grassy slope while New Haven’s ancient Fairbanks-Morse locos paddle around the wreck, and I had no camera! Another such call came on a Saturday afternoon, and I asked him if I could go out with him. In other circumstances, the old man would have welcomed the companionship, but this time he told me “no”, and when I begged, he sharply told me the same with more than a little emphasis. Eventually, on his return, he told me a kid had “hopped” a New Haven train on its way to the car floats, climb the boxcar, and ..…reached up to grab the overhead catenary wires! The arc that followed incinerated the boy, leaving a sad, stinking mess for the railroad and the local officials to clean up. And that was typical of Bay Ridge on regular weekend during the summers. I remember being at another event down in the Bay Ridge Yard, and watching a string of boxcars roll backwards off the car float barge and into the side of a second train. Of course the most horrific Bay Ridge story came in 1961, when the sewerage processing tank at the edge of the yard exploded. A series of pre-stressed concrete tanks, immense things, held thousands of tons of raw sewerage, straight from the apartment complexes, for processing, prior to release into the bay. For whatever reasons, either a problem of too many gangsters in the concrete, or a buildup of gases, one day a tank let go. A tidal wave of feces, kitchen waste, urine, and bacteria, swept across the yard, only advanced by chunks of the tank wall. The wave overturned whole freight cars like H-O trains. Even deep into the yard, refrigerator cars were knocked off their trucks and a New Haven caboose was flipped over in the swirl of decayed debris. The trackmen that went down to right these cars wore no protective suits or face masks. The cranes dispatched to the scene had to deal with chunks of stone that outsized them by tons. Sopping pools of sewerage covered the ties, and one can only hope that no hapless brakemen were wandering between the trains when all Hell broke loose. As far as I know, I own the only pictures of that disaster; color slides taken by my father of an event that nobody would believe today. Even a search online doesn’t give very much documentation to a horror show with which few events in Long Island Rail Road history could compare. Dad started his career during the depression as a crossing guard, then became a draftsman, and started his climb into upper management. It was he who installed the G5s, #39, at the Carriage House Museum in Stony Brook, in 1956. He also recorded the transfer of #35 from railroad property to Salisbury Park, in Westbury. Of all the steam motive power run by the company, he loved the big K4s “Pacific’s” best. He once told me he liked the size and the movement of those engines. Perhaps it was only the steam locomotives that really appealed to him in 43 years of loyal company service. He never took pictures of live steam, but here and there, as I go through the slide record he shot during his tenure, I find a locomotive in the distance while his track crews did their thing. My father never wanted the track to be the cause of any problems on the Long Island Rail Road. Those he admired and called friends included, for the record, Gabe Dobrian, another man named DeSante, George Pack and Bill Thompson. He got along with many, and helped quite a few. 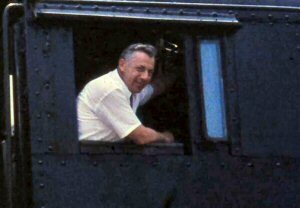 On a train trip home one night, a young Conductor looked over Dad’s pass and mine, and then came back after discharging his duties to say, “Are you Mr. Glueck of the track department?” My father said “Yes”, to which the Conductor said, “Mr. Glueck, I want to thank you for recommending me for this job. I was a trackman and you saw something in me. Thank you.” My father accepted the compliment, and it made a huge impression on his son. By the time 43 years of railroading had passed, the MTA had bought the Long Island. He stayed at his post, helping to usher in the era of M1 electrics, high level platforms, and electric service up the Port Jefferson branch. He told my mother, “I have to retire now or I’ll die with my boots on”. He wished no retirement party, but the guys threw one anyway. He received a watch, along with one for my mother. He sold the house in Syosset and moved to rural Maine where he raised laying hens, a few lambs, and spent quiet hours fishing from his first and only boat. He became a member of the town ambulance squad, raised prize pumpkins, and got to see deer browsing in his field each morning. Had he stay on a few more years, his pension would have become spectacular, but he didn’t and I think he made the right call. One of his friends in management stayed on, got a great retirement, and died of a stroke on his first vacation, never having lived long enough to enjoy the fruits of uninterrupted tranquility. When Dad died, we had a memorial service, heavily attended by local residents. We cremated his remains, and scattered the ashes around his gardens. Four hundred miles away in New York, thousands of commuters raced back and forth over the rails he tended, never having known the contributions of one man who made the trains run. Note: Harry A. Glueck retired from the LIRR after 43 years of service, in 1973. One story I did not put in the piece was how he put the slow order on the K4s (#5406, my baby) prior to the derailment near Amott. Frank Aikman, who my father deeply disliked, ordered him to take the slow order off the train, but my father told him, "Mr. Aikman, if you want the order taken off, you do it. I will not!" Aikman backed down and the events that followed might well have been worse if the slow order was withdrawn. Another funny story was at the conclusion of the Floral Park elevation. Goodfellow wanted to make a big publicity bash about it and called out the news media to document the first train through this modern improvement. An enormous floral wreath had been constructed at great expense over the track where the first train would arrive. Instead, a freight was sent through. An oversize box car hooked the wreath and carried it the rest of the way into Jamaica, with Goodfellow screaming and raving about the loss of the expensive arrangement. I guess some shipper got a thrill out of being recognized with flowers! Our entire family had passes on the Long Island Rail Road. It was “one of the perks” that you got when your father was in management in those days. I’m sure I didn’t use the pass in those days as much as I would today, but that is the perspective time gives you. Until 1956, we lived in Mineola. I was born in Nassau Hospital, which probably explains a great deal about my love of trains. From 1957 until 1973, we lived in Syosset, within a few blocks of the railroad; just enough for good, healthy walk My brother, 11 years my senior, would check out the timetables and figure out how to work the trains so he could take his little brother fishing at Oyster Bay. We’d entrain with our fishing rods and a tackle box at Syosset, go into Mineola, and change trains for the Bay. If I recall correctly, since this was post steam era, the trains were hauled by a gray and orange RS1, long before “Dashing Dan” appeared on the scene. A regular Conductor on those trains was a man named Dan Harrington, and a nicer man you’d be hard pressed to find. Mr. Harrington was always interested in what we were going after, where we were going to rent a boat, and wished us good luck. Frequently, we’d time our return trip so he’d be on the return run from the Bay to Mineola. When we got to Oyster Bay, we’d detrain and walk down the yard while the locomotive was brought down, uncoupled, and turned on the turn table. The watering column stood in the yard yet, not having been cut down in the rush to “modernize”. The whole place smelled of hot ties and creosote, warm air, old bait, and Diesel oil. From there, we’d walk down to the park and rent a boat or perhaps walk up to the beach area near Jakobsen’s Shipyard. That place always intrigued me because of the stacks of tug parts, cabins, wheel houses, and sheet steel. They almost always had something interesting in the berth, whether it was the H.M.S. “Bounty”, built for the film, or the converted sub-chaser turned yacht, “Argo”. The beach was a joke, since it was mostly broken clam and oyster shells, or broken concrete with hunks of twisted re-bar sticking out of it! My brother took some of his earnings from driving deliveries for Jackson Pharmacy in Syosset, and purchased a box of sandworms. Then we’d pile into a wooden row boat and he’d row us out into the harbor to wet a hook. He taught me how to set up a flounder spreader and bait the hooks so the worms didn’t catch you with their sharp, hooked, pincer jaws. They were nasty things! And we fished. Oh, how we fished! I doubt there was anything as much fun as catching flounders from a rowboat with your big brother, then occasionally stopping for a drink of Pepsi (out of the bottle) and scarfing down some ten-cent chocolate Hostess cupcakes. This was paradise. It was rare that we didn’t catch two or three dozen flounder, and Lord knows how many sea robins, begalls, and sand sharks. We tossed back what we didn’t want and strung the rest out on a chain to bring home. When the fishing part of the day was done, two very brown, tired, but happy boys would head back to the Oyster Bay yard. One trip I specifically recall put us in the P54 combine at the rear of the outgoing train. Dan Harrington had us hang our burlap bag of fish in the baggage section, while we sat in the passenger compartment on the dark green leatherette seats. Mr. Harrington told me that he had something for me if I wanted it after he made his way through the train. When he returned, he handed me a huge rubber banded wad of punched ticket stubs, collected after the coach string had made its outbound trip from Jamaica to the Bay and on the return. It must have held 600 ticket checks in every conceivable color of which they were printed. It was the only time I remember purple ticket checks amongst the more familiar reds, greens, and oranges. I kept that wad of ticket checks from that trip until I was into high school. To this day, I have no idea what the different colors represented, but I remember Dan Harrington, and I remember changing trains at Mineola. From that point on, the best part of the trip was over. For the record, we filleted the flounders back at home and yes, we ate the pure white meat. My brother took me fishing many times afterward, too, often at Bayville, on Stehli’s Beach, sometimes down at Quogue, trapping blue claw crabs in the canal, and each time was a great experience with wonderful memories. But I must say with all honesty, the train trips to Oyster Bay, the train ride out and back, and a fine Conductor who was happy to see two young boys doing what boys should be doing, made the “fish trains” special. And I wonder if boys today have that same chance with men who represented the Long Island Rail Road in the manner of great railroaders, like Dan Harrington? For those of you too young to remember, the following is a memory or two, set in Sunnyside Yard, taken from glimpses I'd had riding into Penn Station with my mother. This is set between the age of seven years, up to about fifteen, so that places it between 1957 and 1965. Realize that up until 1958, the accepted way of travel across the Atlantic was by ocean liner, and the back of National Geographic always carried advertising for the Northern Pacific or Great Northern railroads. The Boeing 707 was not yet a "come on", and passenger service was still profitable, along with contracts to haul the mail. Railway Express Agency still thrived. Sunnyside was huge. There was no other description that could do it justice. The tracks were never empty, always filled with a rainbow of passenger cars. At anytime of day, you could easily identify Union Pacific sleepers in yellow, Atlantic Coast Line Pullmans in purple, stainless steel strings for Seaboard's "Silver Meteor", MoPac cars in blue-gray, and Tuscan coaches, diners, and sleepers for the home road. I'm not talking about fifty active cars, either. I mean, perhaps two-hundred or more. Steam lines kept the cars alive. Amidst the tracks little B-1 boxcabs raced back and forth, assembling and cutting trains for imminent delivery to the heart of Manhattan. Occasionally, the overhead catenaries would crackle and sparks flew. I have to be honest here, and tell you, I don't remember seeing the big P5 and P5a motors. I think they were relegated to freight service by this time. What I do remember, and vividly so, were the GG1's, in an assortment of colors. You couldn't separate Sunnyside from the GG1 fleet. I recall seeing the big G's in Brunswick green, what appeared as black, with huge keystone's, a few in cat-whisker stripes, some in red, and almost always, one waiting for "The Keystone", painted silver, with a Tuscan red stripe, running hip to hip. When you consider the vast size of the fleet, a high percentage was always waiting, humming, available, at Sunnyside. The assignments could be to tow anything from a Jersey local, a Washington express, or "The Broadway". GG1's handled everything. Here I might make the admission that they were so common too. Each GG1 looked much like another, excepting paint, as I mentioned. When I started seriously taking pictures, I neglected the G's - not entirely, but seriously. Why wasted film on a locomotive that would be around forever? Oh yes, I took pictures of the GG1's, but by the time I started in earnest, they were being defaced with the letters "PC". Who would want a pictures of those? Look, I was a purist! I imagine the same was said of K4's and J2 Hudsons prior to the death of steam. In 1965, my Mother took my sister and me to visit my Grandparents in Florida, riding "The Silver Star". We rode the Long Island into Pennsylvania Station, then found our track assignment. We had a sleeper, placed about midway through the train. There was a lounge car, and ahead of that, the diner. My sister was a college Junior, an English major, knew everything, so to my disgust, she exercised experimentation with "the sophistication of tobacco" on that trip. This might have been influenced by having seen Eva Marie Saint behave similarly, opposite Cary Grant, in "North by Northwest". Of course that was supposed to be aboard the "20th Century Limited", and we were on Pennsy tracks, and besides, Cary Grant wasn't on this train. Who was on this train was the wife and daughter of actor Jose' Ferrer. Molly Ferrer was my age, and we became companions on the trip south. BINGO! First crush. Other than Molly's friendship, I can say the train was the best part of the trip, family dynamics being what they were. When I was not exploring the train with my new friend, I rode in our compartment, watching the railroad yards, seeing some of the worst sides of towns from New York to Florida, and at one point, seeing strings of wooden refrigerator cars being scrapped. I always looked for steam locomotives, but I saw none. Once I decided to try washing, using the pull down sink in the car. It filled by push-button, and there were tiny bars of soap wrapped in blue Pullman paper. I still have one of those, forty-five years later. The track was not conducive to holding water in a steel sink, and pretty soon our compartment floor looked like the foredeck of the "Titanic". I used a huge number of paper towels to mop up that mess. My mother preferred the lounge car, as did my dopey sister. Mom would order a drink and started to argue Civil Rights and racism with some geezer from Georgia. The geezer claimed to be a professor of psychology and being a smoker himself, told my mother he wanted to do a study of my anger with my sister's lighting up. He called the black staff on the train "darkies". I didn't like him and the geezer was full of hot air, anyway. There was no study. I still don't like him, and I'm certain he's been dead for decades! Someone else I remember was the Porter assigned to our car. He was a black man, as I guess they all were in 1965. A very deferential man, he was dedicated to the Seaboard Line, and anxious to make us as comfortable as he could. It seems to me that he not only made up every bed, he was on call 24 hours a day, for any need or want from a passenger. He brought tea, and at night, we left our shoes outside the compartment door and he shined them. It seemed to me, they couldn't pay me enough money to do half the work with which our Porter was saddled. At night, I slept near the window, or as close as possible. I recall rolling through towns, past blinking crossings, past headlights, against north-bound freights, and standing for periods without motion. My mother told me to leave the shade down so strangers couldn't look in and watch us. Watch us? Nobody was going to watch us unless they stood about nine feet tall and were extremely bored! Eventually, however, I fell asleep. In the morning, we awoke with the train moving at a steady pace through endless orange groves. It was an amazing sight, and still registers with me today. Bless my Tropicana! We endured a week with my Grandparents, second degree sunburns, and no swimming, because my grandparents didn't like it. When we took the train home, I remember two things; One, Boca Raton was a flag stop, and some guy stood out on the track, lazily dragging a handkerchief left and right at crotch level to flag the train, and two, spraying Bactene on my sister's back all the way home. So what does the story about my Florida trip have to do with Sunnyside Yard? Nothing, other than the train originated there, and it opened the secret of what those innumerable strings of colored cars contained. It is probably worth saying that this was railroad passenger travel in the old sense, prior to Amtrak, and while management still believed a comeback was possible. Like a patient with some lingering terminal disease, "The Silver Meteor", "Southern Crescent", and even "The 20th Century", were doomed, while ridership grew thinner and thinner. The last time I visited Sunnyside, it was late at night, and I was in the company of an adult railfan, on our way to Pennsylvania to photograph a steam fan trip. This was when I saw the hidden gem, last of the species, reduced to work train status, the last DD-1. By this time, she had a black rectangle on her side, with huge white numerals for the Penn Central. I walked over and touched the side, just so I could say I touched an active member of the species. I didn't have my camera or tripod, so no picture. As far as the tracks of the yard were concerned, they were still in place, but vacant. No passenger cars staged a comeback any longer, and the big show was over. In subsequent years, the tracks were torn up, the DD-1 and a B-1 switcher consigned to museum status. Something like eleven GG-1's are preserved, some in great shape, some in horrific condition. Some are kept in Pennsy territory, others scattered to as far away as Texas and Indiana. None will run again.